Well I hit 80 a couple of days ago. The first thing we managed to do is a couple of quick heroics. 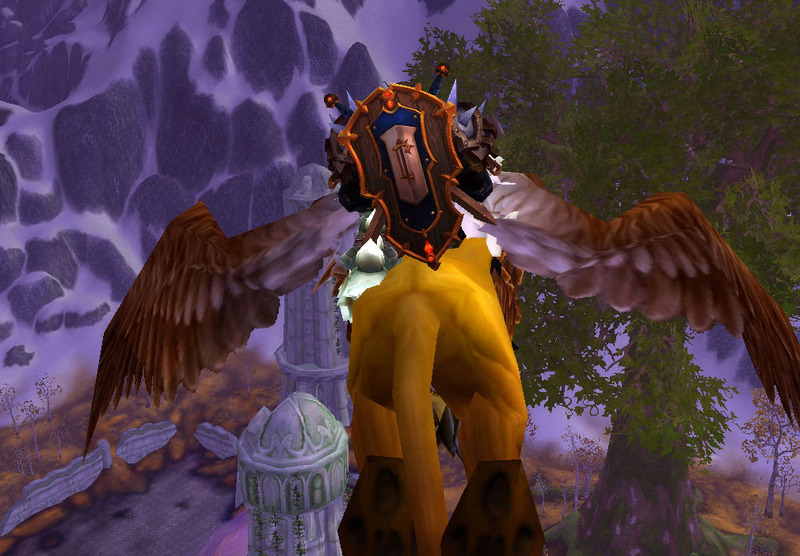 I had every intention of hitting up Heroic Utgarde Pinnacle, but alas it was not to be. I did manage to get into a pretty good pick up group for Culling of Stratholme. Was a pretty good run until my only guildmate in the run had a cable outage. 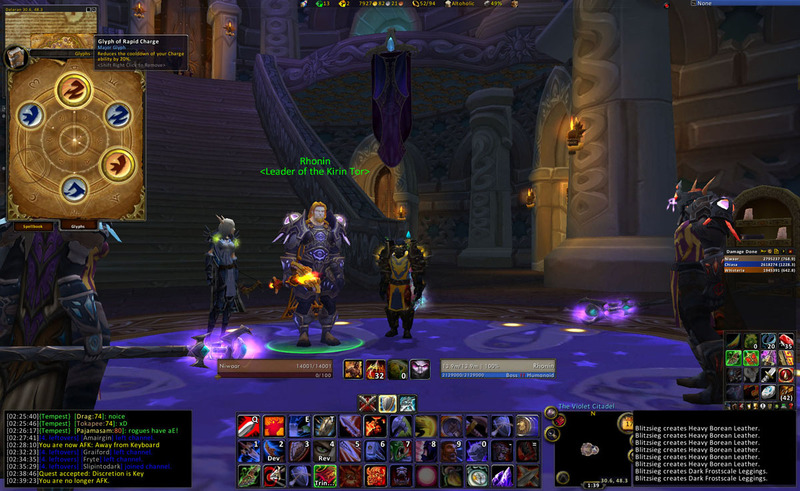 We managed to blackmail a guild mage to join us for the end of the instance and voila!. Its a wonderful shield and one of the very best looking in the game at the moment. I will be doing a few Heroic Guides over the next week or so, as I learn all of the instances. 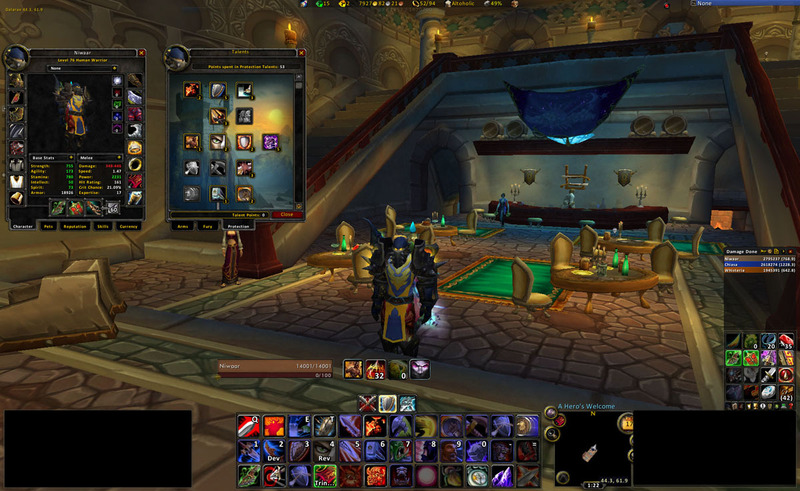 This is the second part of a multi-part post on Leveling as Protection. The first post can be found here. We are not tanking for 10 levels. We are leveling. All our gear and glyph choices must take this into account. We want to get to 80 with the least trouble and time as possible and to that effect we will be making some choices we never would make if our goal was to tank. We all had a good month of 3.0.2 to play around with Glyphs. The vast majority of us picked up glyphs such as Glyph of Sunder Armor, Glyph of Heroic Strike or Glyph of Revenge in order to tank whatever Heroics, Karazahn or any of the 25 man raid instances. Things are different now. We are leveling, we do not care about things that will help us tank and keep threat more easily. We all have, as a paladin friend of mine says, “the threat of Jesus”, we do not need to worry about it right now. We want things that make us more efficient. We are looking for damage, mobility and an overall increase in our killing speed. Glyph of Rapid Charge: You are going to be using charge. It will be the most used button you have next to your Shield Slam and Devastate buttons. Being mobile allows us to pull large groups and get to our next kill(s) quickly. Mobility is king in leveling, and this is our mobility as warriors. Glyph of Revenge: Many people may say that Glyph of Heroic Strike is a keeper here. It is a good glyph do not get me wrong. But once again your crit rate is going down. Even with Incite, you are going to have diminishing returns with this glyph as you level up. While Glyph of Revenge will be just as good as it was at 70 as it is at 80. A free Heroic Strike every 6 seconds while leveling is a lot better than 10 rage if you happen to critically hit. Glyph of Charge: Adding 5 yards to Charge gives us a range of 30 yards. This is the way you will pull while leveling. None of the other Minor Glyphs can even compare to the usefulness of increasing our Mobility even more. Glyph of Thunder Clap: The 2 yard increase may seem minor but that is exactly what it is meant to be. A small increase in our range. However, this is a 2 yard increase in the overall radius of Thunder Clap, which is actually quite a huge difference in practice. Glyph of Bloodrage: The third minor glyph is a bit of a choice. The first two are just plain the best and nothing can touch them. Choose Bloodrage for one simple reason. Bloodrage costing ~350 health is immense. We can easily make that health up via trinkets, or a quick bandage at times. Using Bloodrage at its normal ~780 health is prohibitive while leveling. Halving that cost makes it extremely usable on a regular basis. I write this from a point of view of someone who walked into Wrath with a minor about of raid DPS gear. I managed to collect “off-spec” drops off most bosses. It does not matter the level of your gear. It matters what you are focusing on. We want to concentrate on a few things to make ourselves kill and move on as quickly as possible. The biggest thing we are doing while leveling now is collecting a good number of mobs (3-10+ depending on gear level) and using our new and improved AoE damage capabilities to kill many at once. To do this we put our sights on certain statistics on our gear. We want to keep our SBV as high as possible. Remember this is a double stat for us. Our ability to take damage and give damage is directly connected. The more SBV you have, the bigger damage you are giving out with Shield Slam and Damage Shield. Plus, with pushing your value as high as you can, you can push most mob melee damage into hit for block. While we may want raw AP, strength gives us more SBV as well. Our direct damage abilities such as Heroic Strike, Revenge, Concussion Blow, and Devastate all scale with our Attack Power. Some people may consider Agility greater than Critical Strike Rating, but it has a much higher cost in terms of item budget. We want to crit, we want to crit all the time. Unfortunately, our crit will plummet to nearly half of what we start out at 70 with. There are a limited number of quest rewards with crit rating on them. Make sure you are keeping them as you go along to keep your crit rate up. Not as useful for us as protection as it is for our fury and arms brethren, but it does help us. It scales quite well and the more we sunder the better off we are. The one problem is that we are not sundering everything and while AoE grinding so the scaling is lower and not all of our damage is helped by APR. Stamina only helps us in terms of our survivability. Do not go out of your way to get more stamina gear. While upgrading your gear through quest rewards you will often find that there are many rewards with zero stamina and some with HUGE amounts of it. Try and keep yourself at around 12-13k health unbuffed and you should be golden. Do we take the tanking gear or the damage gear? Well luckily most of the options are either or. Which means we will have amble time and options to facilitate our gear choices. It is only the random quest that will give us the options between a damage neck and a tanking pants. Remember that we will be tanking again at 80 and that choices need to benefit us then. Choosing between tank and damage options can be difficult though. There are early tank-centric quest rewards that will last you deep into leveling. For the most part, anything under level 76 is going to be easily replaced at 80. The biggest thing you need to come to grasp with is that you can and will be able to tank virtually all of the leveling instances with your Burning Crusade tanking gear. Your Tier 4+ and badge gear will be more than adequate for you and your party to survive. Take damage gear when its an upgrade. Common sense in setting ourselves up for efficiency will be the best thing you can do for yourself. Area of Effect grinding and questing will serve you well in making best use of your time. Gearing and Glyphing for this specifically will allow you to move as quickly as possible when leveling solo or in a small group of friends. Concentrating on mobility, shield block value and strength will be the easiest means of doing this. I hope the small pseudo-guide will help you level. I will be posting on the trials and pitfalls of each zone specifically over the next week. So stay tuned. Is everyone leveling as protection? To be honest, since the expansion went live on Thursday, I have yet to see many dps warriors roaming around the frozen (and not so frozen) wastes of Northrend. It seems that many warriors have got protection to level. A lot of tank sites out there are dealing out their ideas on how to level. How to spec, where to go, what to do when you get there. I would be remiss if I was to not weigh in on the subject. Especially since my person choices in speccing differ greatly from some of the other prominent tanking writers out there. Some of the things we do not pick up will be counter-intuitive for a seasoned tank however. My leveling spec is one that I had to really think about. At 70 there are a few things you can do and many people have said many things. I looked at everything carefully from a stand point of pure efficiency in killing and moving on. I came up with my level 70 leveling spec.